Brushing your teeth at least twice a day, flossing them at least once, and taking care to clean along your gum line each time are the basics of good oral and periodontal hygiene. Most people recognize this, and many of them adhere to it, yet gum disease and other chronic oral health conditions continue to affect a majority of people across the world. That’s why, at our Encinitas/San Diego Periodontal office, we strongly emphasize not only the importance of good oral hygiene, but also educating patients about the nuances of keeping their smiles healthy for life. 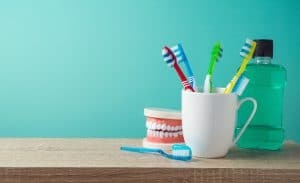 Brushing and flossing your teeth are well-known necessities, but for the most part, additional measures like rinsing your mouth with mouthwash are still considered non-essential. Typically, brushing and flossing may be enough to remove the plaque that has built up on your teeth and gum line throughout the day or night. But, these tools can only do so much. Swishing with mouth rinse after you brush can boost your efforts by rinsing away food particles and oral bacteria from the hardest-to-reach areas of your mouth. Sometimes, keeping your teeth and gums clean can seem like a chore, even if it isn’t exactly hard work. Yet, unlike chores or actual work, you can’t take a vacation from it. Skipping even one toothbrushing and flossing session can leave your mouth vulnerable to harmful oral bacteria found in plaque. To efficiently protect your smile, be sure to practice good hygiene consistently, every day, without skipping it even once. While consistency helps ensure that your hygiene routine is effective, it isn’t always a guarantee that oral bacteria won’t lead to a growing oral health concern. Your chances are greatly reduced, but to ensure that gum disease or another concern doesn’t develop, your hygiene routine must include regular professional cleanings and exams with your dentist or periodontist. Professional cleaning is the only way to remove the spots of tartar (calcified plaque) that develop when you miss a spot during your home hygiene routine. It’s also the most effective way to determine if an issue has already developed and requires additional attention. Good oral hygiene is the most important building block in good oral health, but it may take a little more than you realize to make sure your hygiene routine is on point. For more information, schedule a consultation with Dr. Kania by calling her periodontal office in Encinitas/San Diego, CA, at (760) 642-0711.